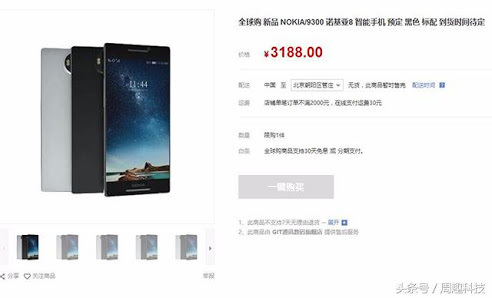 A new Nokia Android smartphone has been spotted on the Chinese e-commerce website up for pre-registrations. The alleged Nokia 8 is now listed on JD.com in China and comes with a price tag of CNY 3,188 (roughly Rs. 31,000). Unfortunately, it’s hard to confirm the authenticity of the online listing of the Nokia 8. With less than a week left in the event slotted by HMD Global on Sunday, the e-commerce listing tips that we can expect the Nokia 8 to be announced. The images accompanied in the online listing appear to show concept renders of a Nokia smartphone with near bezel-less display. On the specifications front, the rumoured Nokia 8 is said to be powered by Qualcomm’s latest Snapdragon 835 processor while sport a 5.7-inch QHD Super AMOLED display. The handset is further likely to feature a 24-megapixel rear camera with OIS alongside a 12-megapixel front camera. Nokia 8 is expected to be announced in two storage versions – 64GB and 128GB. Both the models are rumoured to come with expandable storage support via microSD card slot (up to 256GB). It is said to run Android 7.0 Nougat. For the upcoming event, HMD Global is widely expected to bring back the refresh of the Nokia 3310feature phone which has hogged all the limelight. Other Nokia phones expected to debut later this week include the Nokia P1 high-end smartphone alongside two budget Nokia devices – Nokia 3 and Nokia 5. Nokia 6, the smartphone touted as the comeback device for Nokia, is also expected to see global availability details out at the same event. The official HMD Global event is set to take place in Barcelona on Sunday, and it will kick off at 4:30pm local time (9pm IST).